Experience the peace and tranquility of living in a bushland setting, yet only 15 minutes from the City. 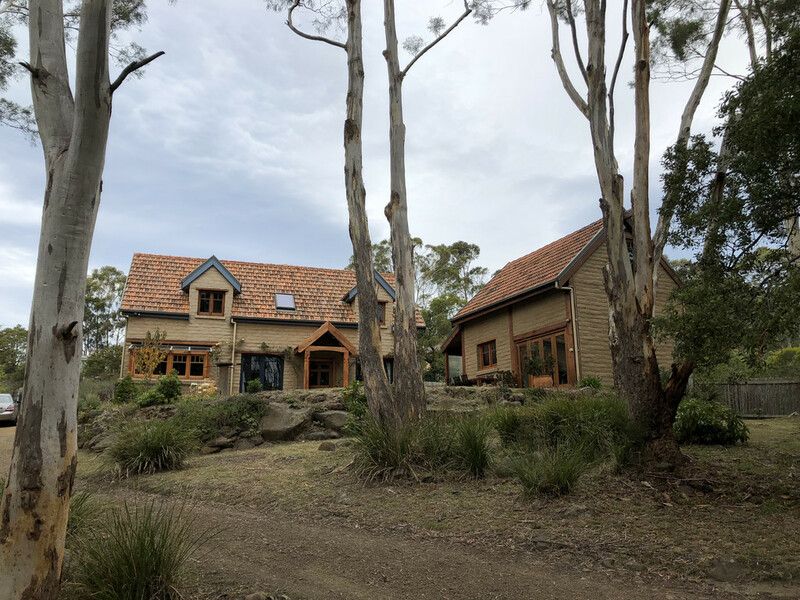 This unique property comprises of 3 main buildings constructed of handcrafted bricks, Marseille terracotta roof tiles and mixed together with a historical collection of Tasmanian timbers giving a warmth and character rarely seen. The main house is double storey and comprises of an open plan kitchen, living, dining area plus laundry, bathroom, toilet and the first bedroom on the ground floor. The dining area is surrounded by Huon pine windows creating a sunny conservatory feel overlooking the gardens and natural bushland. A cast iron wood heater and a reverse cycle heat pump will keep you toasty warm. Upstairs are two queen sized bedrooms with a large living area in between. The second building adjacent to the main house is a double storey chalet. This would happily suit the teenager or older student in the family, seeking their own space. Fully equipped with a cosy kitchen, separate bathroom, sunny living area and reverse cycle heat pump. The upper floor of the chalet is accessible by a set of pull-down attic stairs. Excellent for storage or a gaming room. The large artists studio at the rear of the property sits snugly in the trees providing the ideal setting for painting that masterpiece or writing that novel you always dreamed of. The studio has electricity and a large wood heater. Also on the property is a lock up garage/workshop adjacent to a large double carport. There is also a carport at the front of the main house for easy access in all weather. The home is only a short stroll from the Mt Nelson Signal Station & Brasserie Cafe. Close to the Mt Nelson Store and Hobart College.